Exeter Cub Scouts have filled their empty summer days with lots of fun activities and service projects the last few weeks. Several of the scouts volunteered for Bingo at the Exeter Care Center and also helped lead a Flag Day program at the Care Center. They put flags up in downtown Exeter for Flag Day as well. During the week the scouts met for an afternoon session at the library and learned from Assistant Librarian Jessica Votipka how the library is organized. They explored the library's computer check out system and also looked up a book using the Dewey Decimal System. While they were at the library they helped with a recycling project and did a little clean up at Storybook Park. The weekend found the pack headed for a campout at Lone Star NRD facility. 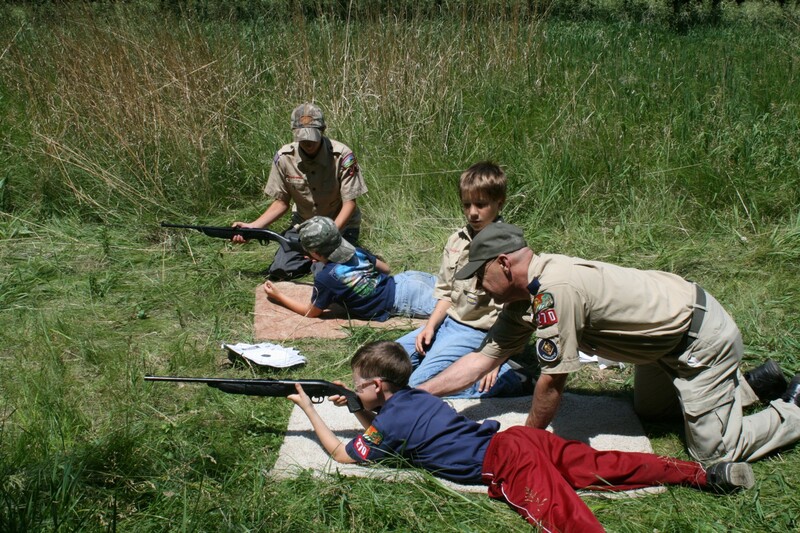 The scouts played flag football, made father's day gifts and pool noodle swords before they cooked hot dogs for supper. They boys did several skits for their families around the campfire before they enjoyed some s'mores. Despite a late night storm that dumped an inch of rain sending everyone to their vehicles, the boys enjoyed the event. They spent Saturday fishing and enjoying lunch before heading home to clean up the mud on their gear. 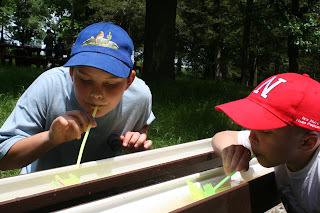 Cub Scouts from Friend and Exeter enjoyed a day living like Tom Sawyer at the Crete Youth Cabin near Crete. The boys got to hike along the Blue River, make rafts like Tom Sawyer used and race them, and make their own jump rope. Richard Brunkow, of Milligan, brought his rope making equipment and each of the boys got to make a 12 foot piece of rope. The boys enjoyed lassoing tree branches and other objects throughout the camp. The scouts started their Leave No Trace badge and practiced picking up the trash and sticks in the camp before leaving. They also earned the Photography Belt, learning about how photos take a roll in communication and history. They learned the parts of a camera and methods for taking better photos. Five Boy Scouts from Friend Troop 270 helped at each station throughout the day. Clint Oldehoeft tightens a nut on his Father's Day Hat Holder project while Peytan Brandt works on his pool noodle sword. Braden Capek cuts off a piece of pvc pipe for a pool noodle sword with the help of Dean Bartu. Ben Bartu looks on in the background. The Exeter Cub Scouts learn about the Dewey Decimal System from Assistant Librarian Jessica Votipka. The are pictured from the left Jackson Beethe, Clint Oldehoeft, Votipka, Ben Bartu, Cayden Hartmann, Briana Capek and Braden Capek. Exeter Scouts learn about the computer check out system the library uses from Assistant Librarian Jessica Votipka. The scouts are pictured from left to right Clint Oldehoeft, Jackson Beethe, Braden Capek, Cayden Hartmann and Ben Bartu. 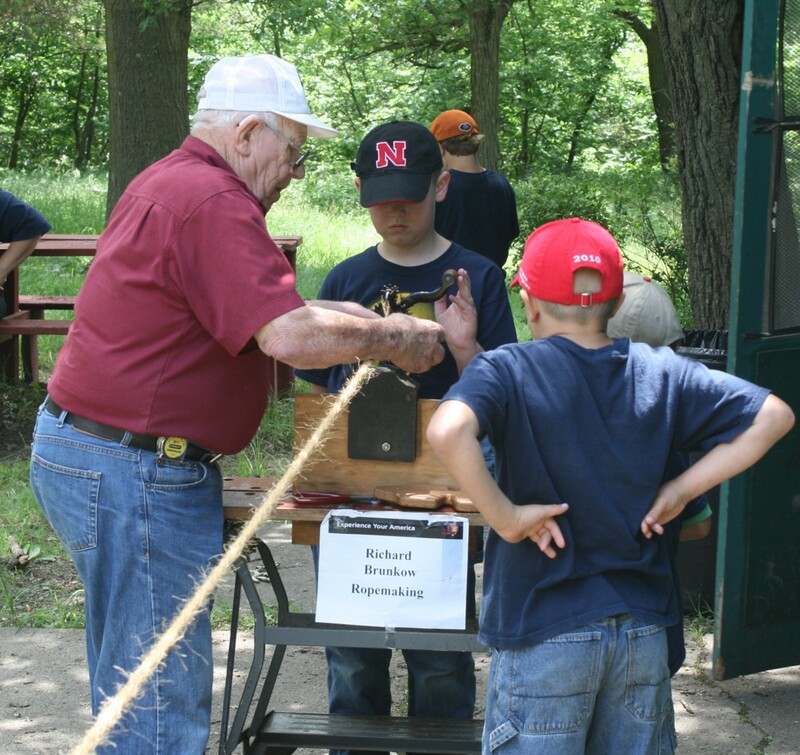 Richard Brunkow makes rope with scouts from Wilber and Claytonia at the Prairie Winds Tom Sawyer Cub Scout Daycamp. 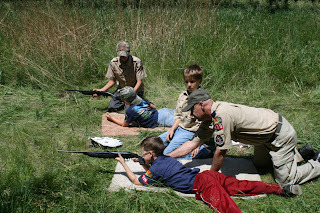 Friend Cub Master Robert Vickery assists Keegan Newsome while Friend Troop 270 Boy Scouts Joey Bartu and Liam Noel run the BB gun station at the day camp. Liam is helping Cub Scout Ben Bartu. Friend Pack 270 Cub Scout Micah Noel (left) races Exeter Pack 218 Cub Scout Braden Capek with the Tom Sawyer rafts they made during daycamp. Bear Scout Jackson Beethe helps a resident with Bingo. Wolf Scout Ben Bartu calls Bingo at the Exeter Care Center.